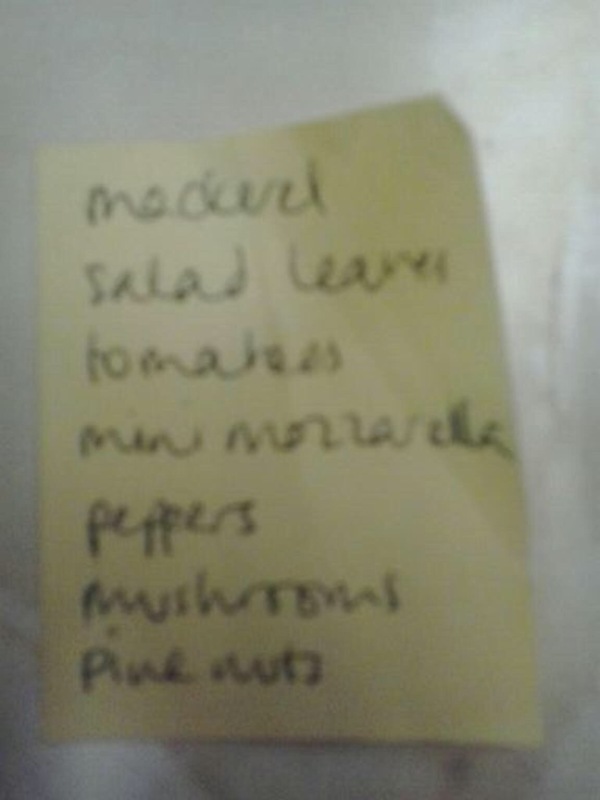 “items are mackerel, salad leaves, tomatoes, mini mozzarella, peppers, mushrooms, pine nuts. List has been written on a small post it note. Maybe a last minute list before leaving work to get items on way home but the writing is quite neat. This suggests to me someone who is trying to eat healthily. Looks like a one meal shop.They are probably going to have a salad with mackerel, sun dried tomatoes, peppers, the mini mozzarella and possibly the pine nuts. I wouldn’t personally put mushrooms in a salad, but others might.